The Altura Varium is a dependable waterproof jacket which is sleek and form-fitting so you don’t feel like you’re struggling against the wind like you can in some traditional cycling waterproofs. Made from highly breathable softshell fabric with fully-taped seams this brilliant jacket allows excess moisture to escape while preventing rain and external moisture from creeping in. With a performance fit this stretch fabric waterproof doesn’t flap in the wind and features a slightly dropped tail to ensure you remain fully protected even when you’re tucked down in an aggressive cycling position. Altura have made sure there’s plenty of space to store essentials such as mobile phone and wallet with the addition of a zipped chest pocket and a two-way zip rear pocket with internal phone pocket. Pit vents let excess heat escape and reflective trims help enhance your visibility to other road users making the Varium safe, comfortable and user-friendly in unpleasant weather conditions. Lovely jacket, great quality. I am 96kgs and xxl fits me well. Comfortable fit rather than tight fit. At Merlin price , wonderful! Happy customer. Very impressed with the quality for the price I paid. keeps me dry and warm. Lovely jacket. Smart in appearance and has a little built in tummy room. The material does not feel plastic and is very breathable. Nice design. Have worn it in a few rain showers and have remained dry, although not in heavy rain as yet. Quality feel. Great jacket for rainy winter. Got my second one. Fantastic jacket and great value. Waterproof without getting too warm, this is my second Varium after wearing out my first one. Good for year round riding if you layer correctly, highly recommended. First cycling jacket I have ever used. The zippers are pretty easy to use and the pockets are spacious for my needs. There is a spot for the phone in the back, which is able to fit an iPhone 6s (with a case) snuggly but might be too small for a wider model phone. I really like the cuffs because they are flat and tight. Overall, it is a great jacket. Great value. I would def pay full price for this jacket. It's so breathable can be used as a wind stopper all day but it works as good as any waterproof when it rains. This fabric is excellent which is the key. Bravo! Love this jacket, classy looks and quality feel. Worn it twice now. The first time it rained pretty much my whole ride and it kept me dry (except around the collar of my jersey where I think the rain had come through my helmet and down my neck. I'm not sure how you can avoid that really) Second time a chilly early morning ride and it was perfect with just a base layer underneath. Newbie to cycling but not to outdoor kit, hiking, skiing etc, so needed a cycling w/proof. I have to say this jacket is a stunning design, especially in red, great feel and look, tried the 2XL as that's all that's left, had to return as way too big, gutted (I take large in jerseys, XL in jackets), this varium 2015 version was the nuts, shame, assuming it's now discontinued. Good tight fitting waterproof. Can be a bit hot if worn on a warm day. Good jacket with noticably excellent breathability, side zip vents help. This is a winter jacket and does not fold down to stick in rear pockets. Waterproofing seemed fine. Used so far in 5-10 C range with showers and road spray. Defintely one for cold conditions or cool and wet conditions. The look & feel of this jacket is excellent and better than some of the overpriced 'premium' brands. At the discounted price it is exceptional value. The cut is quite slim, I'm 67kg and 176cm and M is just about OK. Performance is excellent too, so I look forward to many dry miles! This has to be one of the best Autumn/Winter jacket available made even better by the discounted price from Merlin. I can vouch for its waterproofing credentials having used it in some monsoon conditions, and yet when the skies clear it dries quickly and doesn't leave you overly sweaty thanks to the material and the pit vents. The front zip is also extremely smooth and easily raised and lowered with one hand to aid cooling when climbing. The sleeves are super long with great cuffs and there is no difficulty in ensuring a massive overlap with gloves to provide superb cold weather and rain protection. The tail is generous and the hem has a silicon gripper strip that works really well. The fit is quite racy so there is virtually no flappy material even in the blowiest days. I am 73kg and 5'9" and Medium fits me perfectly. I'm normally a medium in street clothes so no need to go up a size with this jersey. If faced with the prospect of a very mixed day of weather its the go to jacket for me as it saves carrying a separate waterproof. The small zip pocket on the front is large enough to carry a gel or energy biscuit, but also a convenient secure place for keys or cafe cash. The large zip pocket at the rear has a very efficient 2 way zip with toggle exertions which makes access simple. The rear pocket also has an internal pouch into which smaller mobiles will fit although given the earphone aperture its probably meant for an iPod. The only criticism I have of the jacket is the single rear pocket rather than Altura having designed it with the standard 3 pockets or even one open on and one zipped. Apart from the design issue this jacket is 5 star in every other respect. I like it so much I now have 2 and will rue the day they wear out and I'm unable to replace them. I initially had concerns re size but went with my instincts and the medium was a perfect fit. The reflective trim is a pleasing addition and if riding in warmer conditions the ventilation zipps are ideal for keeping cool. The front chest pocket and rear double zipped pocket are excellent for holding phone, gels, and food. I have yet to ride in a really heavy shower but looking at the quality alone tells me I will be keeping warm and dry. A superb price for a quality product. Delivery was extremely quick and notification of delivery was spot on. 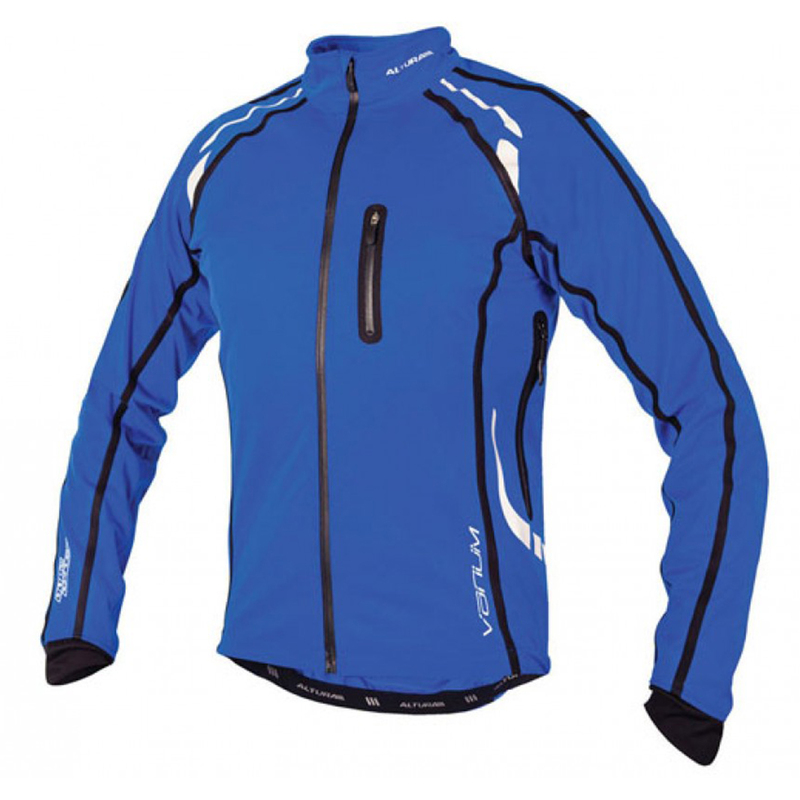 This jacket is absolutely superb, it fits well, looks good which also provides a little more inspiration for a new to the road cyclist and the icing on the cake it is good value for money when comparing with other similar products . Beautiful jacket! I have not taken it out for a spin yet but it fits like a glove! Feels great!